Abelia's received their name to honor Dr. Clarke Abel (1780 - 1826) who collected seeds and plants of the Chinese Abelia around 1817. He was the Chief Medical Officer and Naturist to Lord Amherst and member of a party sent to China to improve diplomatic relations with the court of the Emperor. At the time, the British were only allowed to collect plants on the Portuguese controlled island of Macao as tensions over perceived arrogance from the British towards China had grown. However, when Lord Amherst learned that he had to bow before the Emperor, he refused, leading to him and his group being sent packing. Not sure where the Chinese ever thought the Brit's were arrogant? It was only until 1842, with the Treaty of Nanking, that the British were allowed to enter the country again. During their short stay, Dr. Abel had managed to collect samples of the yet unnamed Abelia, in Ta-Koo-Tang, south west of Shanghai. Fortunately for Abel, a small sampling of the material was left with a colleague in Canton, which proved fortunate as trouble was ahead. It started when the ship he was traveling on, run a ground on uncharted reefs off the coast of Sumatra, Indonesia. In an effort to stay afloat, a seaman jettisoned the cargo, which included his collection. The day after, they returned to the site of the wreck on a smaller boat in an effort to salvage the plants, but were attacked by pirates who were looting the site and suffered capture. 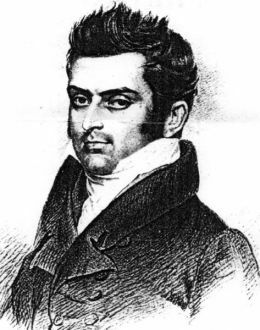 Dr. Abel did finally make it back to England and eventually, the small collection that Abel had left in Canton, was returned in safely in 1844 also (18 years after Abel's death). Abel published his adventures in a book called; Narrative of a Journey in the Interior of China. in 1818. Though not plant related, he also mentioned recording the first Sumatran Orangutan, also named in his honor, as well as having an audience with Napoleon Bonaparte whilst in exile on St. Helena. Call me a geek, but I love reading how historic events crisscrosses with one another. Now back to the plant in question. Chinese Abelia can be a large growing, deciduous shrub, reaching 5-8ft with long flailing pendulous branches. Pruning can be carried out in early spring if you need to control the height, by cutting back as severely as a Forsythia and at about the same time you would prune a Forsythia too. The straight species is seen rarely in gardens and is scarcely available in the trade. Reports from the J.C.Raulston Arboretum describes this shrub as attracting more Butterflies than any other plant in the garden. It's without question a flowering machine, beginning in mid-summer, and continuing all the way until the first frost. The arching stems produce large trusses of white, nectar rich, fragrant flowers, set against soft pink bracts creates a marvelous two tone effect. The Guru of all things woody, Dr. Michael Dirr, was responsible in producing two very exciting forms worthy of any garden. Although, the flowers were open pollinated and some questions remain over its lineage, I feel that they both fit the mold of a Chinese Abelia. 'Rose Creek' is by far the best, non variegated form. 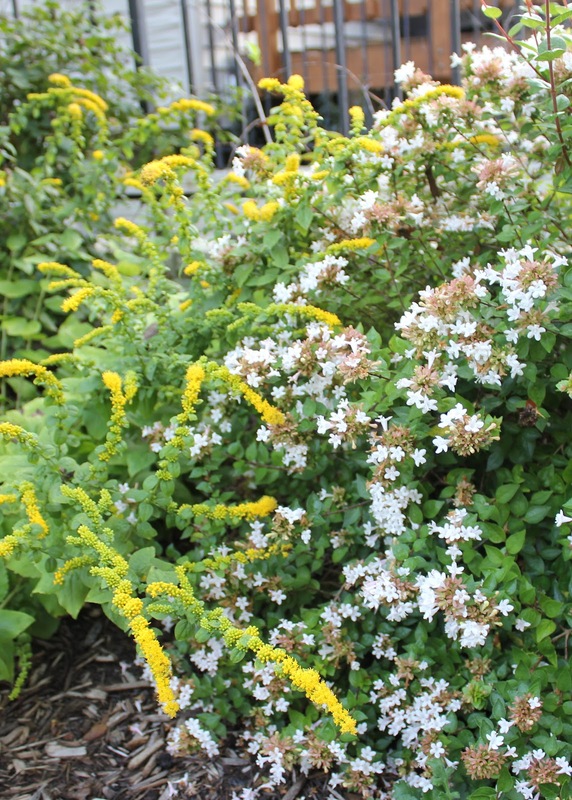 Low, but uprightly mounding, this 3x3 ft shrub has a lot of charisma! Its seems to be more floriferous in the early part of the season, but the Rosy pink calyx's persist well into fall. 'Canyon Creek' is the larger brother, growing well into 4-6ft in height. New leaves emerge coppery-orange turning into a soft yellow as the foliage matures. Warm reds highlight the leaves prior to leaf drop in fall, but further south, it will remain evergreen. The flowers have a soft pink glow, and just like Rose Creek, show off the Rosy-pink calyx's for just as long. Proven Winners, also have released there own form, 'Ruby Anniversary', a new colored form. The dark glossy foliage has a ruby red hue as both new growth and fall color are produced. Last year was the first time I brought this in to the garden center and was blown away by its performance and the speed it sold out, both at the growers and in the store . Like all Abelia's, the Chinese Abelia is heat and humidity tolerant, pest free and deer resistant. Once established their watering needs are minimal and can be left to put on a show with little or no interference. 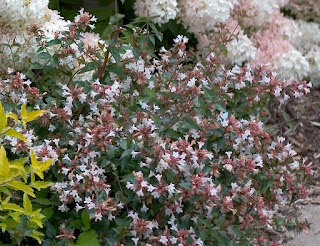 Modest, yet free from arrogance, unlike the person connected to its history, this Abelia will certainly be a pleasure in any garden. The best part, you don't have to travel to China, its already here! I have either Mardi Gras or Kalidescope (I can't remember!) dwarf abelias in my front garden. I love them, too! :o) They're variegated and look great with the loropetalum. 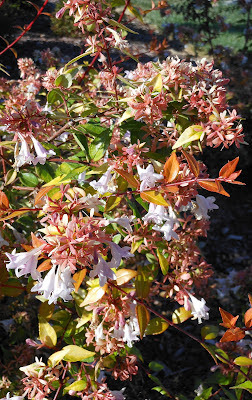 Do any of you know where I can obtain some Abelia chinensis seeds (Kaleidoscope)? I have looked online everywhere, I just cannot locate anyone that has some for sale. You are a geek but I'm a bit of a nerd so it's all cool. :o) I really like your historical posts.